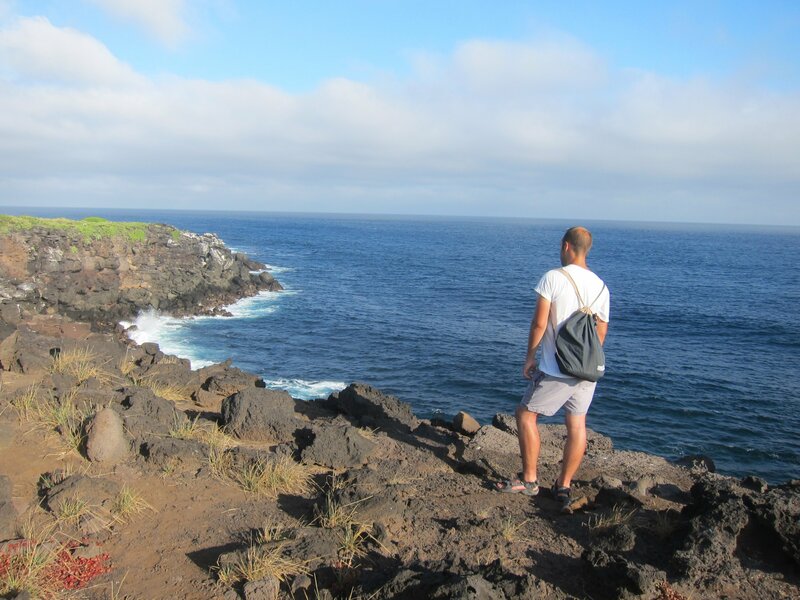 Galápagos, one of the world’s most famous locations for wildlife. It’s known for its countless nature documentaries, mostly narrated by the incomparable David Attenborough. It’s a dream destination for animal lovers, but usually steeped in mystery and myth about how expensive it is and how impossible to get there. I’m going to tell you why it’s more attainable than you’d think and more worthwhile than anywhere else to visit if you love unique, off the beaten track holidays (and animals). 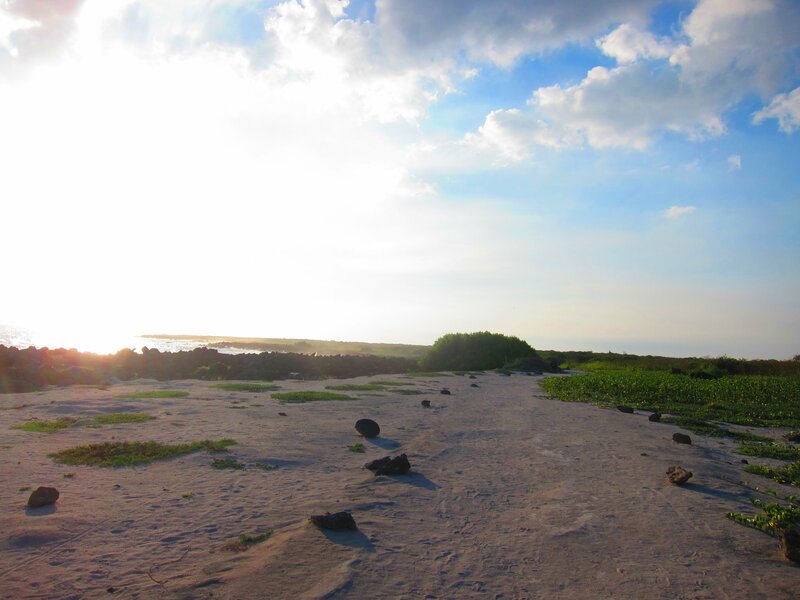 Galápagos is famously the place we attribute with Darwin and evolution, and it’s a fascinating place to visit for the variety of landscapes and fauna. 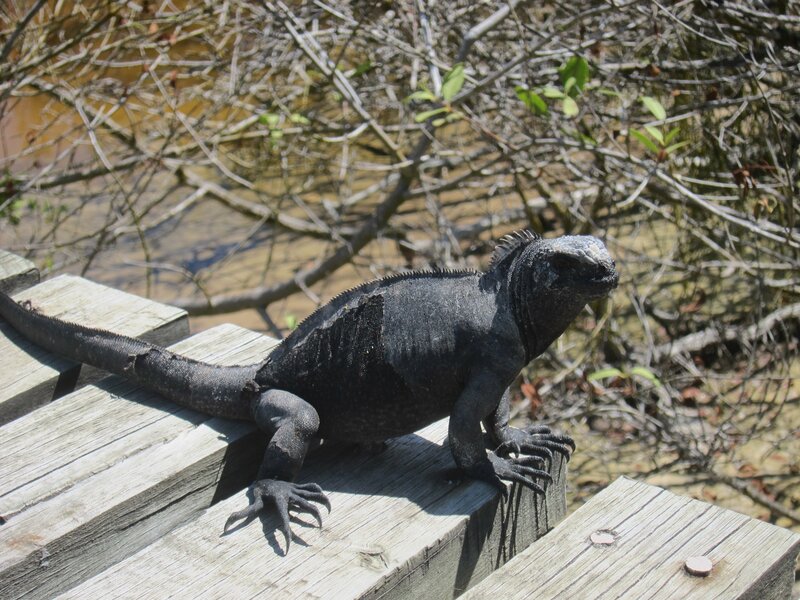 If you’re a reptile lover particularly, you’ll fall in love with it here. 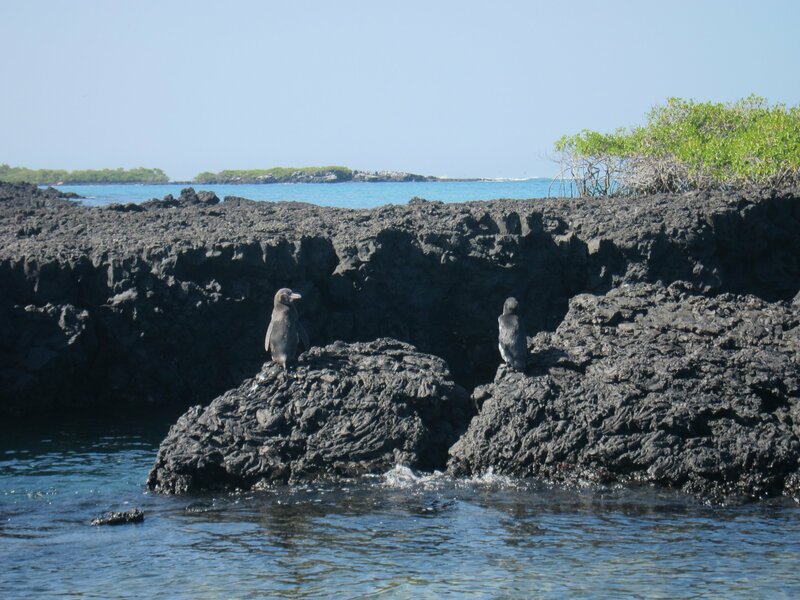 As an archipelago of several islands, ranging from larger inhabited ones to much smaller deserted ones, Galapagos has earned a rep for being expensive to travel as you’ll need to join a pricy cruise. This simply isn’t true, firstly the cruises themselves have a vast variety of comfort options so you can pick your level of price, days islands you see etc. and pay accordingly (always book once you’ve arrived not in advance and negotiate hard). The other option, is to independently island hop using the quick 2 hr ferries between islands and combine with fantastic day trips. 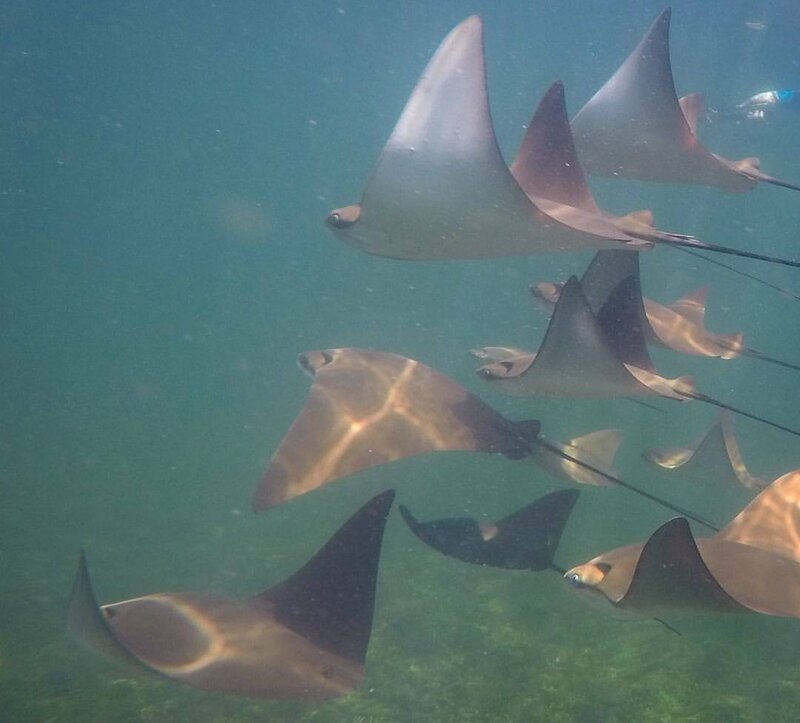 This was what we did and we saw more wildlife than we could have ever dreamed, we would massively recommend this as an economical option and you can find our entire 2 week itinerary below as a guide to doing Galapagos on the cheap. 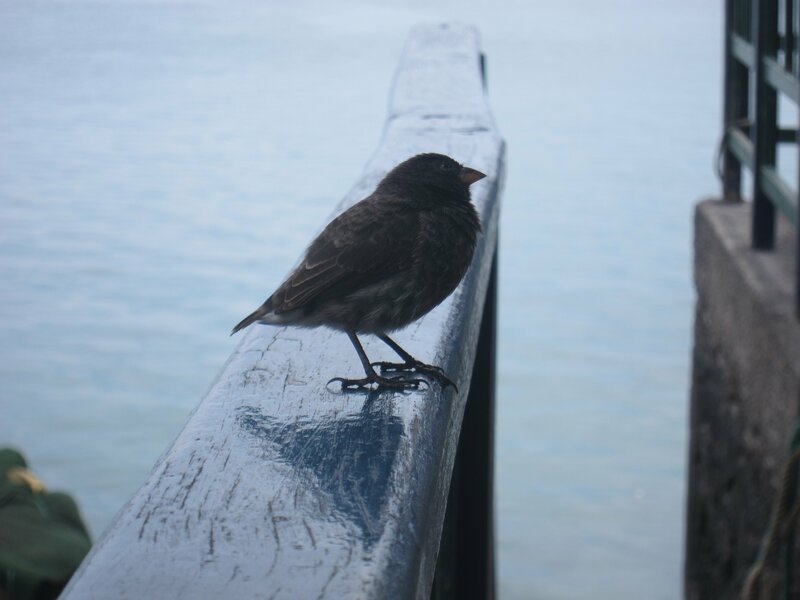 One of the best things about Galápagos which we learned early on, is that this place is ruled by the animals. 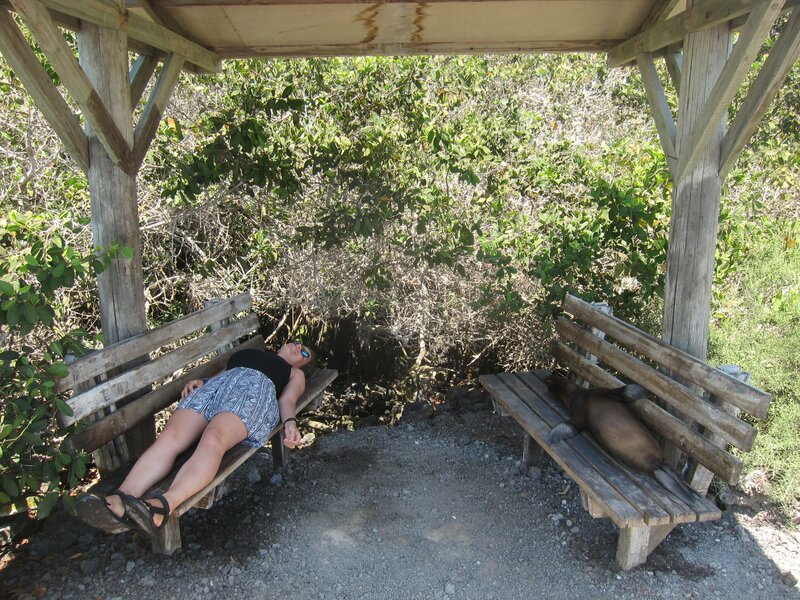 The conservation work here is so serious that the density of fauna is insane and they have such a disregard for people that a sea lion will very happily steal your sunbathing spot if you’re unlucky. People come second here, animals first. And if there’s only one reason you visit, it should be because of this. 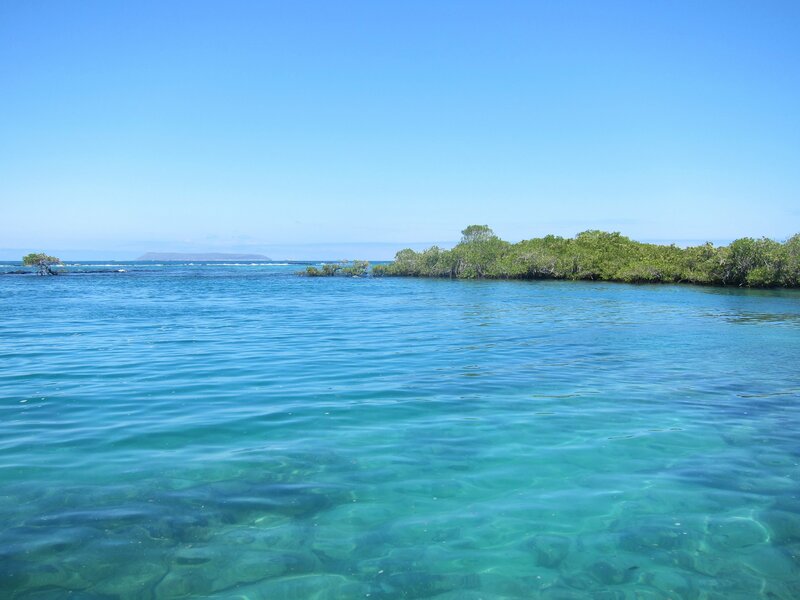 The main inhabited islands are Santa Cruz (the capital, you’ll fly into here), Isabela (hands down my favourite, most beautiful and varied island in Galápagos for wildlife) and San Cristóbal, a gorgeous little island with some great snorkelling and day trips. Now, about the food! 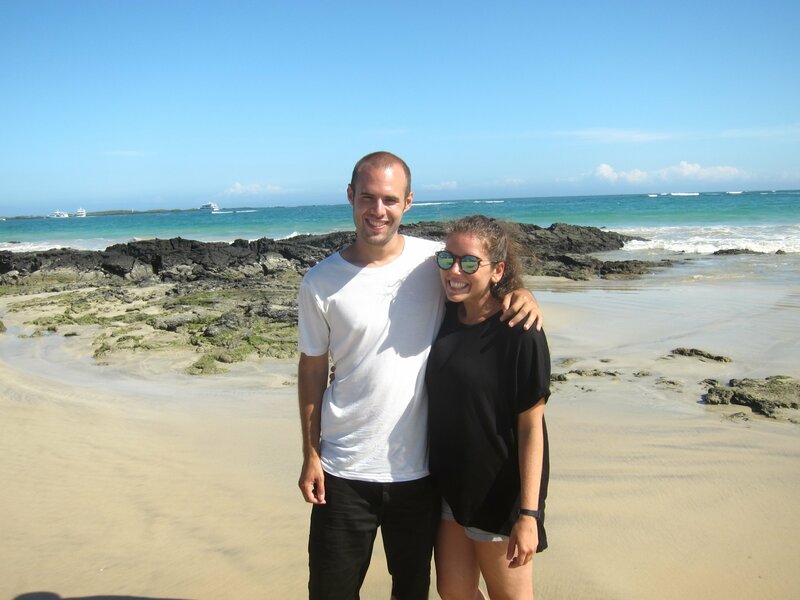 We were pleasantly surprised by how great it was in Galápagos. It’s obviously simple, uncomplicated stuff (especially on our budget) but there are some great options and the fresh local produce is fab. 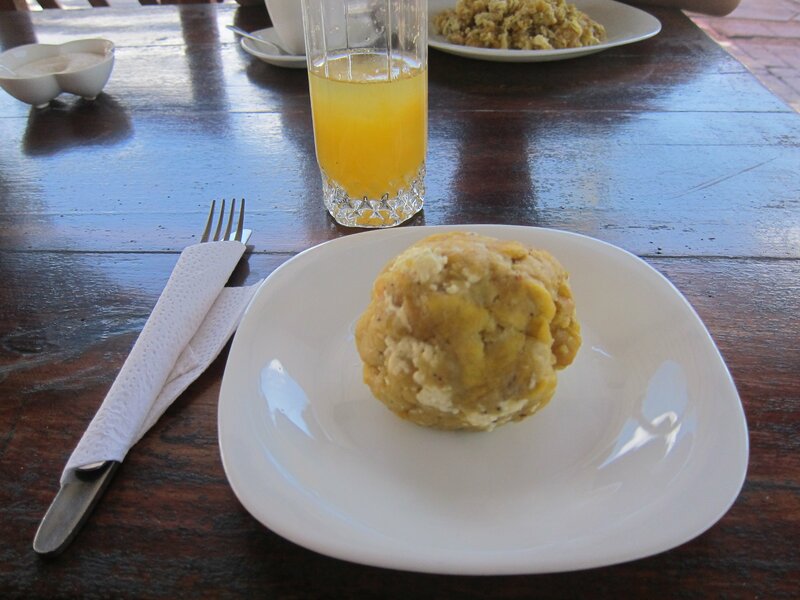 Bolón de verde is a typical Ecuadorian breakfast, made of smashed fried plantain, with cheese rolled into a ball. That’s it. Sometimes it was served with beef stew, sometimes just a ball on a plate. Definitely strange, but definitely tasty and filling. 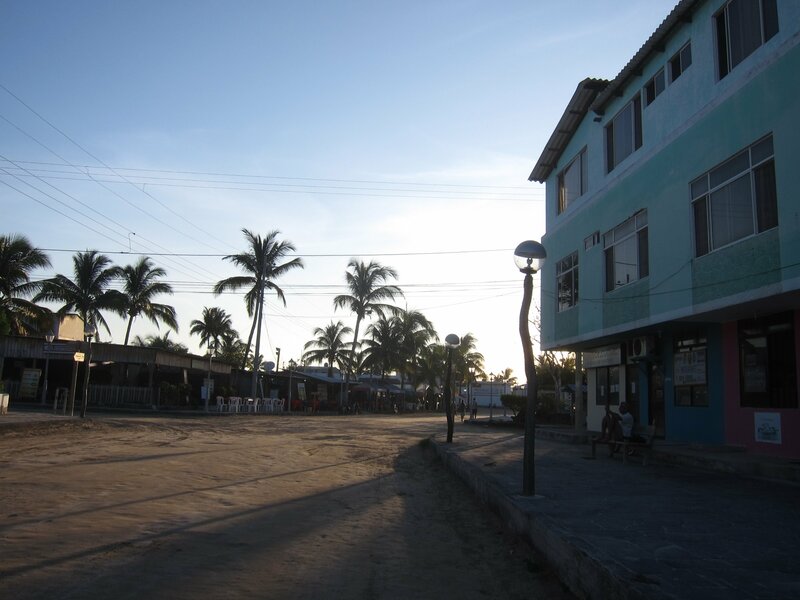 Best places we had it was the cafe above the supermarket in Santa Cruz and the restaurants in the main square in Isabela island. 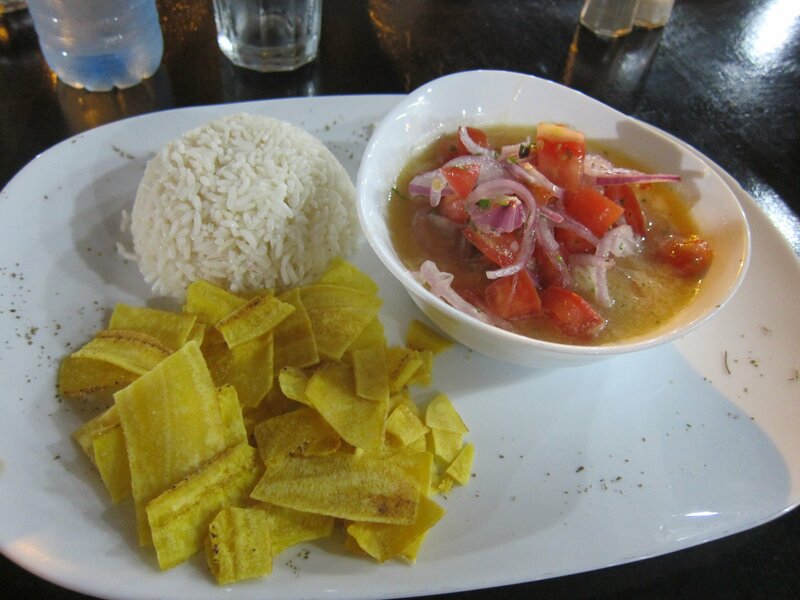 Similar to it’s Peruvian neighbour, Ecuador has a ceviche obsession, as do I so it suited me well. We had a lot of ceviche in Galápagos, mostly great and fresh (not as artful as Peruvian ceviche, they are the masters after all – see my post on Lima for the best ceviche you can have). 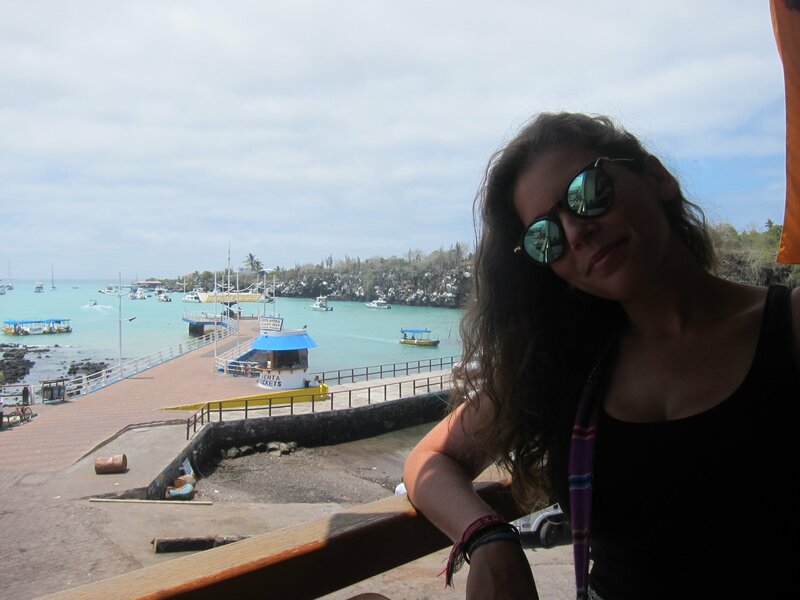 The best we had in Galápagos was in the pirate themed restaurant (you can’t miss it) on Charles Binford st on Santa Cruz island. 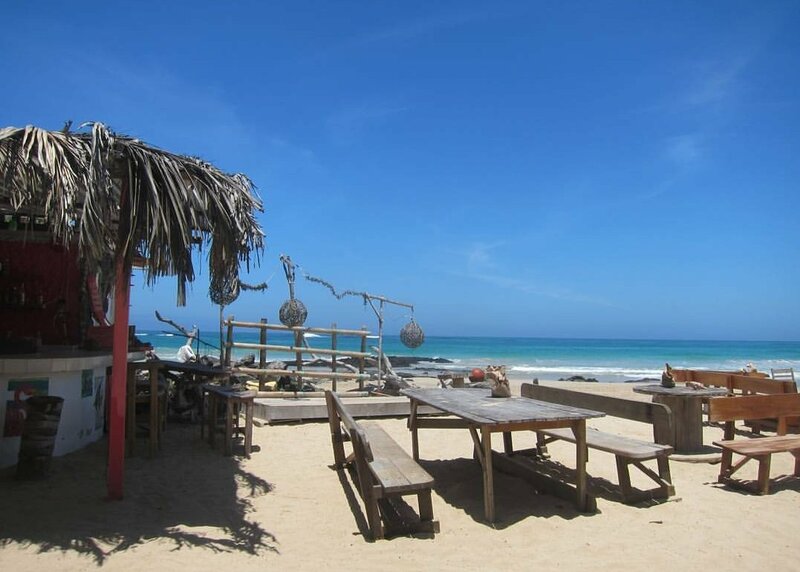 Also notable in Galápagos is Isabela island’s fab beach bar – go for happy hour and the best sunset you’ll ever see (being watched by a host of basking marine iguanas). 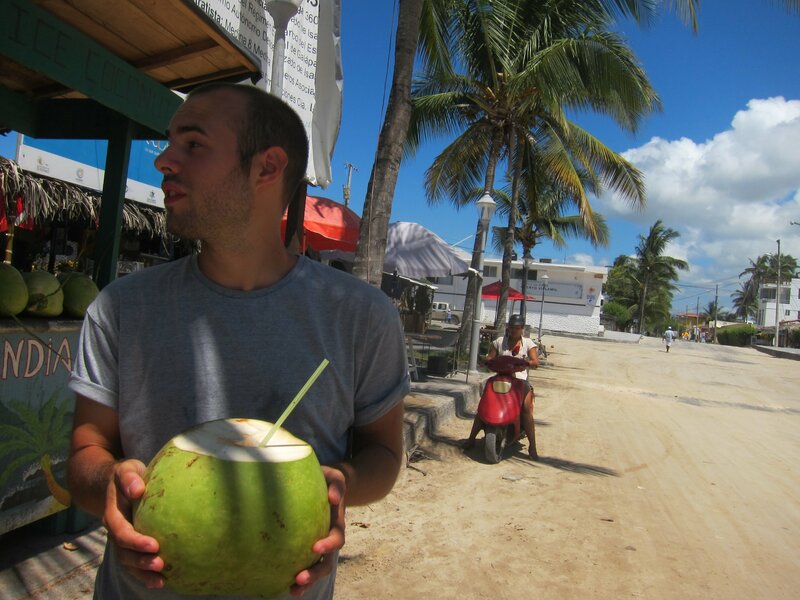 Or the wonderful fresh coconuts which you can get in the main square in Isabela. Rather than a cruise, we did: 1 night Sta Cruz, 4 nights Isabela, 3 nights San Cristobal and returned and did 3 more in Santa Cruz. We saw pretty much every unique animal in the guidebook. 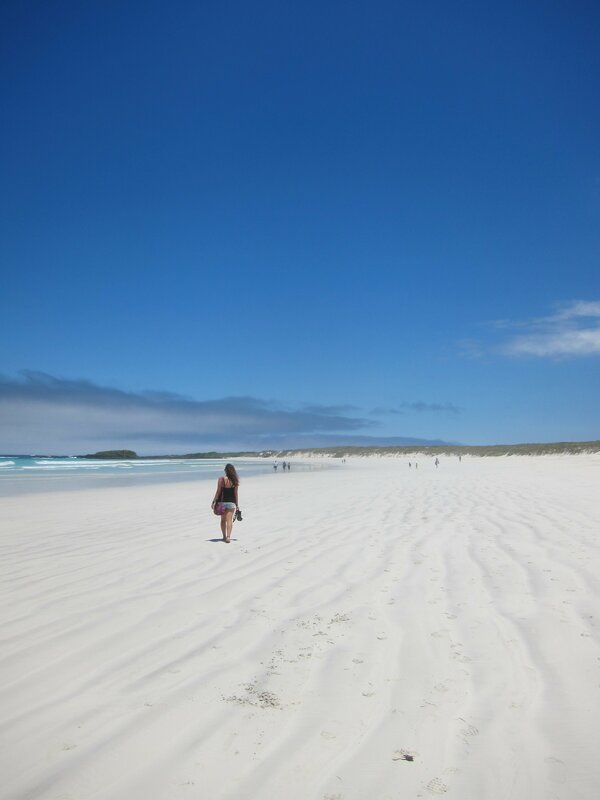 But we did lots of daytrips to more remote places which was expensive (still not as much as cruise) but worth every penny. 2. 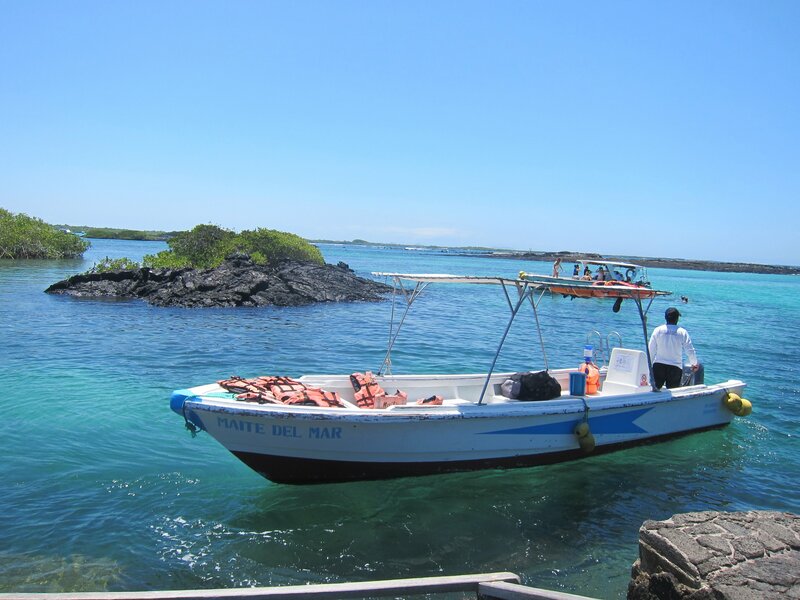 Boat to Puerto Villamil, Isabela. Stay hostal Gardenia it was cheap and nice family owned it (we negotiated price to $38 pn). 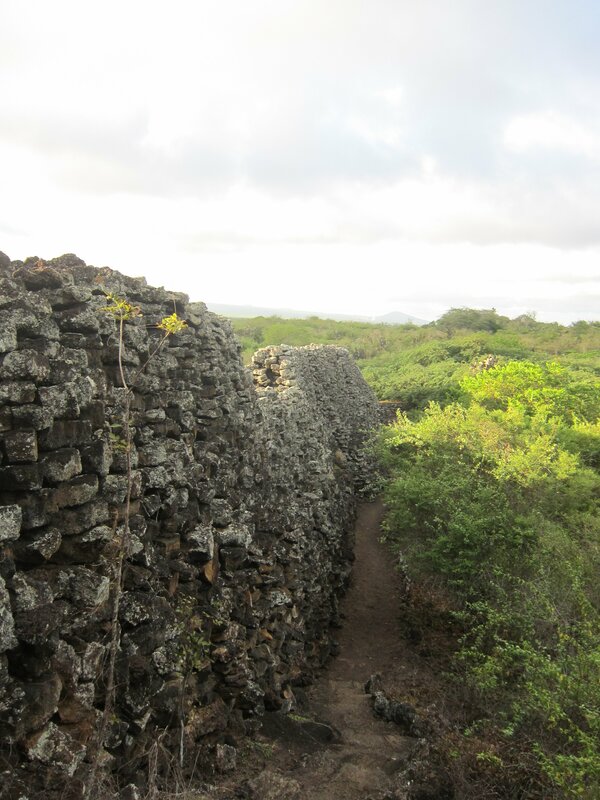 Go down the road to Pahoehoe and book Los Túneles tour for either next day or day after if booked ($90 pp). 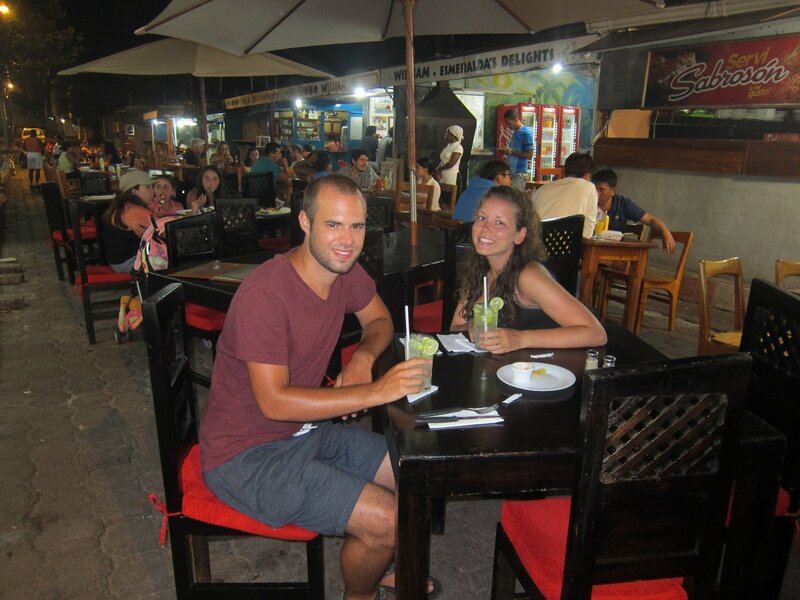 Drinks at beach bar, dinner at Shawarma place at end of road down from Gardenia. 3. 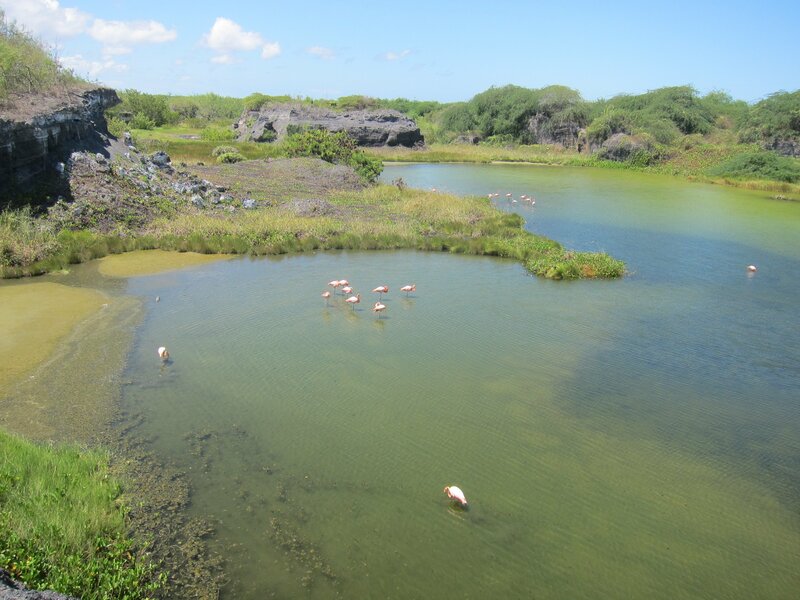 Chilled day on Isabela: Walk up to the lagoon walkway (iguanas and flamingos) Keep walking right up to tortoise sanctuary and up further to second lagoon, come back via the main beach where the beach bar is, lots of iguanas and amazing beach (we got engaged here!) Siesta and dinner at a cheap set meal place in the main square. 4. 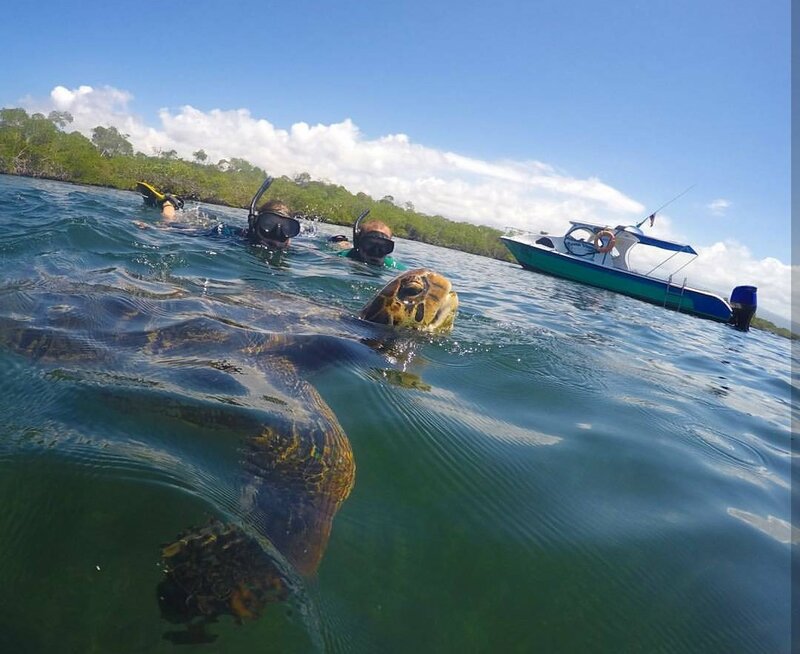 Los Túneles tour, incredible you’ll see sharks, rays, turtles and seahorses. Bring a USB stick/SD card to steal the guide’s pics! (And bring your own Gopro or equivalent if poss). 5. 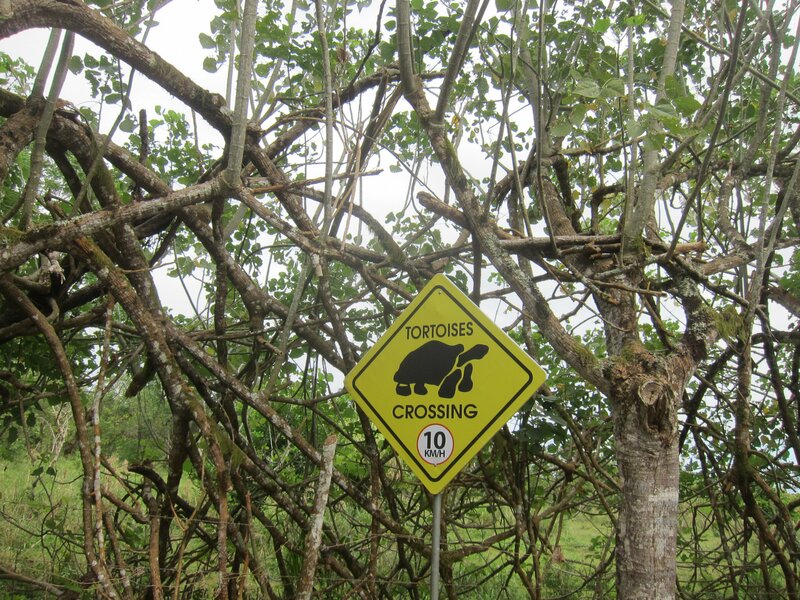 Active day on Isabela: rent bikes and bike up to the wall of tears (watch out for wild giant tortoises on the way!) 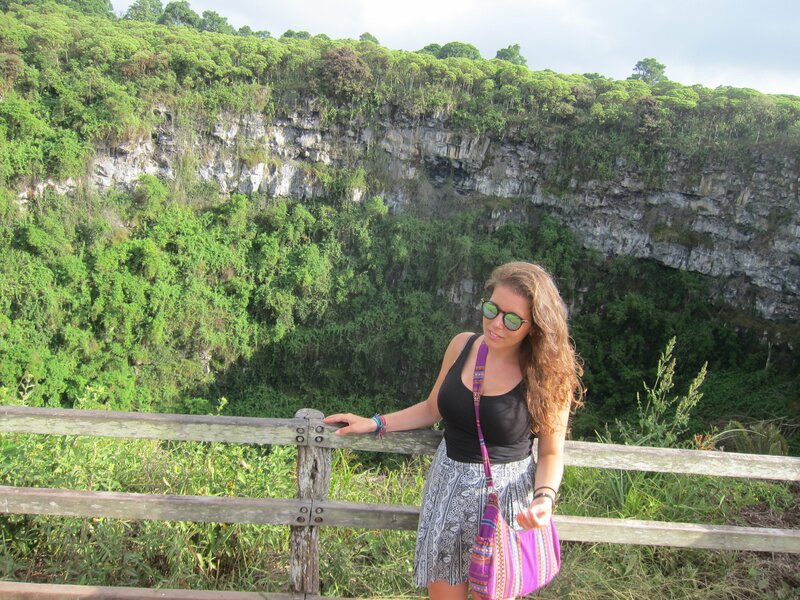 Hike up the hill at mountain of tears for amazing view). Cycle back. Shower, siesta. 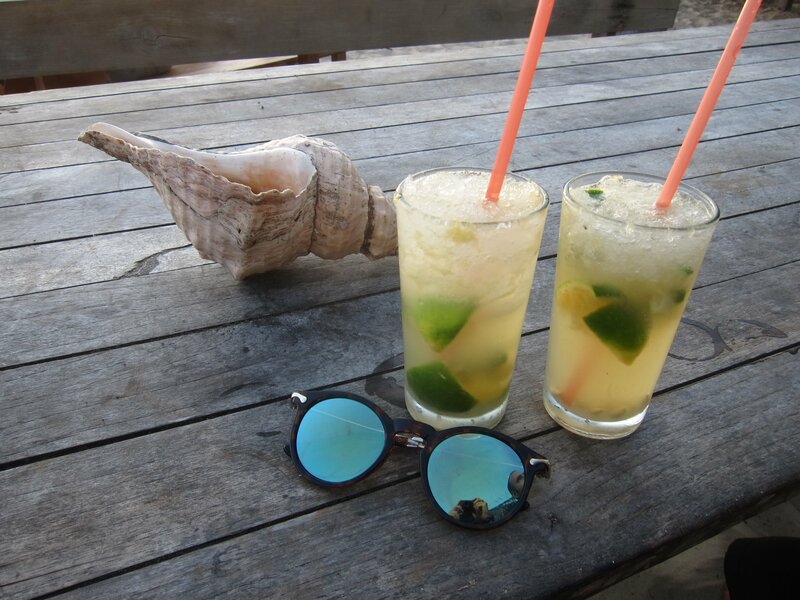 Beach bar in time for happy hour. Book boat tickets to Santa Cruz. 6. 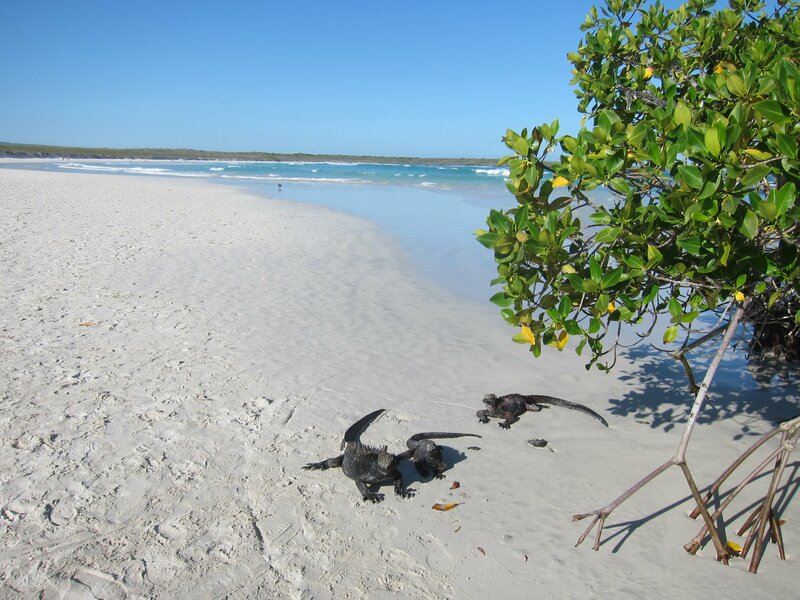 Chill Isabela day- snorkel at concha de perla all day, bring own snorkel (puffer fish, diving marine iguanas, sea lions). 7. 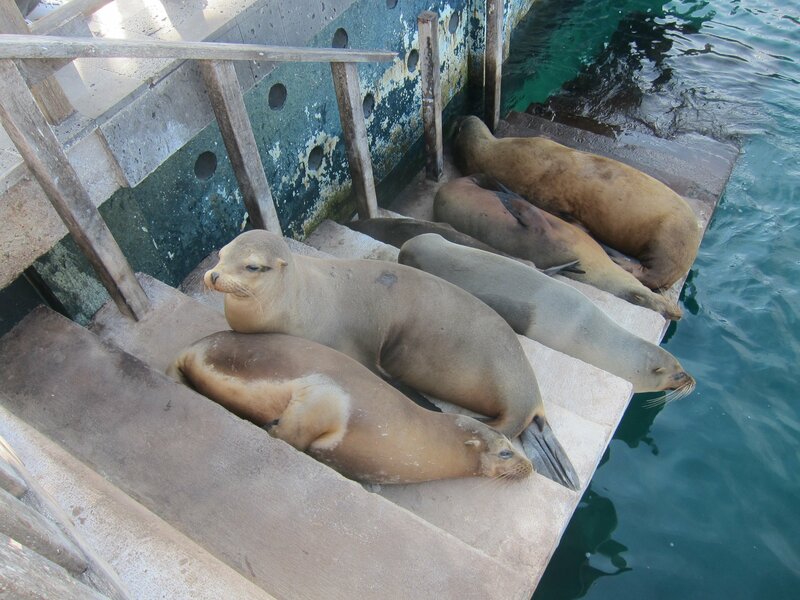 If you have a spare morning do las Tintoreras tour $50 pp (penguins, rays, sharks and sea lions!) It’s not as rated Los Túneles but still really amazing. Boat back to Santa Cruz buy tickets to San Cristobal on way to hostal (book ahead, you won’t find anything left in the eve). One night in Santa Cruz. 8. Boat to San Cristobal. 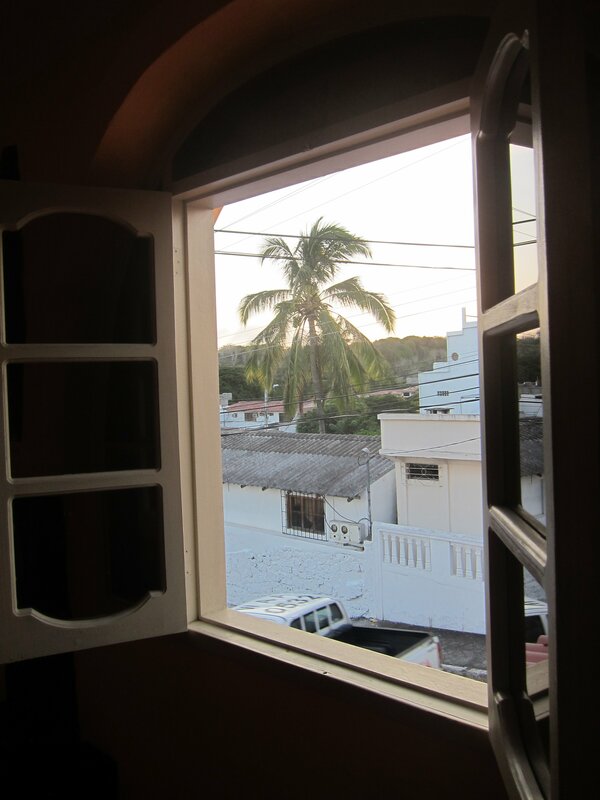 Stay at casa Mabell (tiny cute flats owned by lovely old couple, cheap and AC and own kitchen!) There’s a big market up the road and we made meals in the flat, also good bakery nearby. 10. 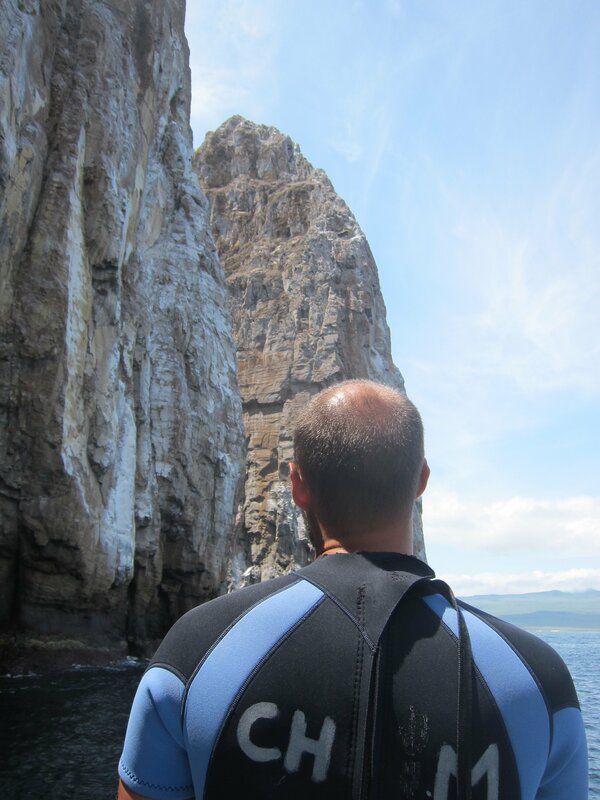 Kicker rock snorkel trip – imposing giant rock formation in middle of the sea, watch out for choppy tide! 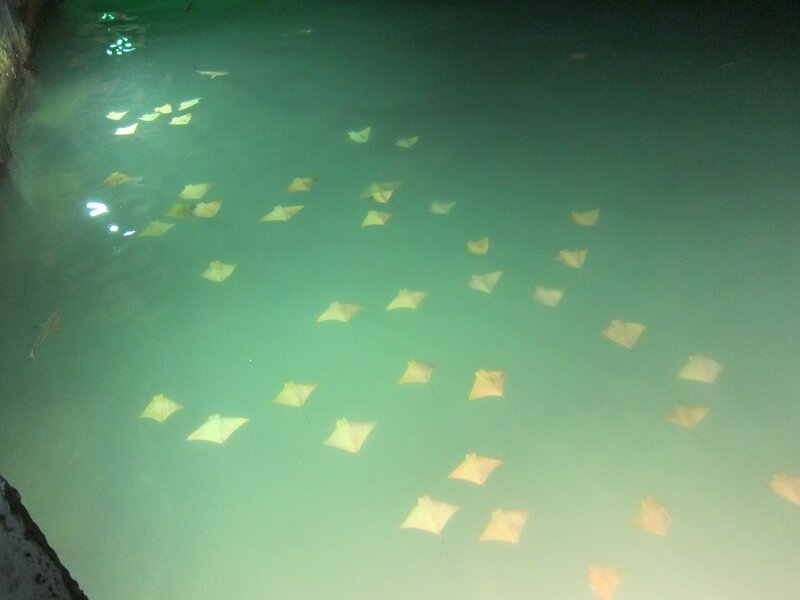 (Can see sharks, lots of fish, rays). 11. Boat back to Santa Cruz. 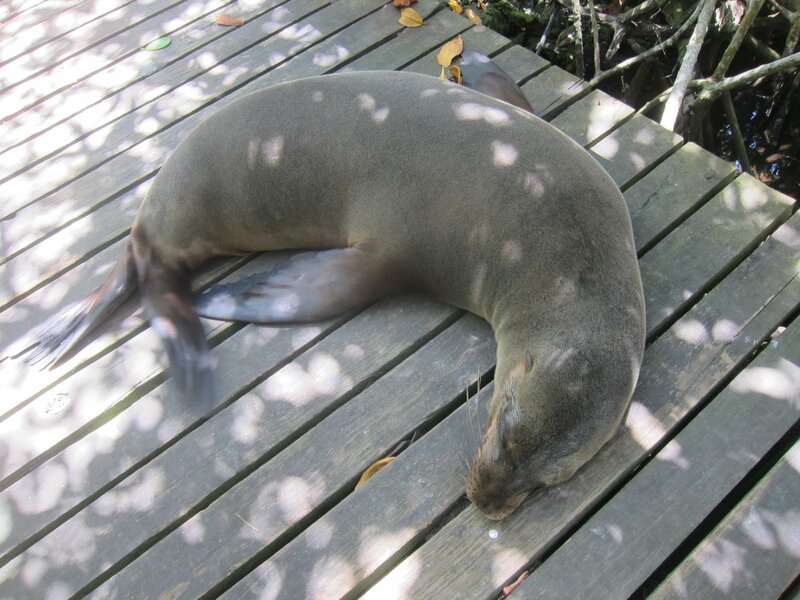 Walk up to Tortuga bay, sunbathing. 12. 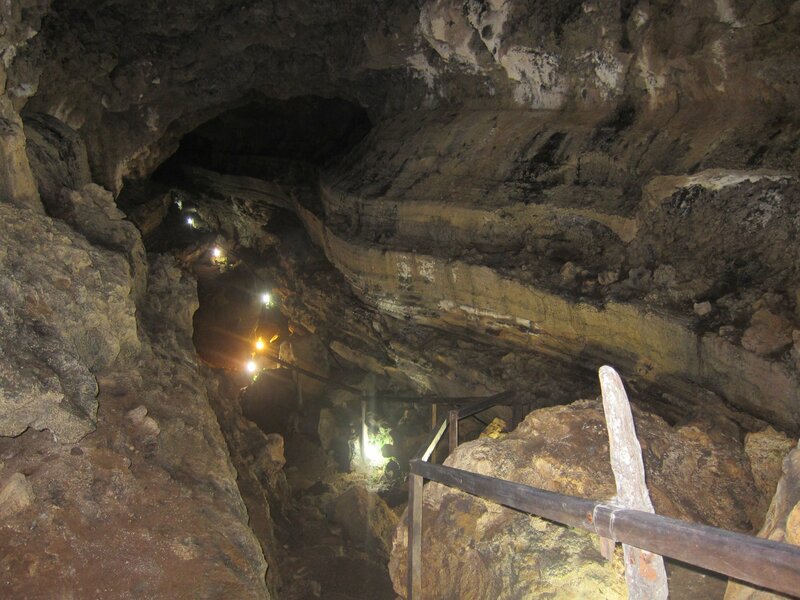 Hire a taxi to take you up to El Chato tortoise reserve, past the giant sink holes Los Gemelos and into the lava tunnels (taxi drivers act as tour guides too). 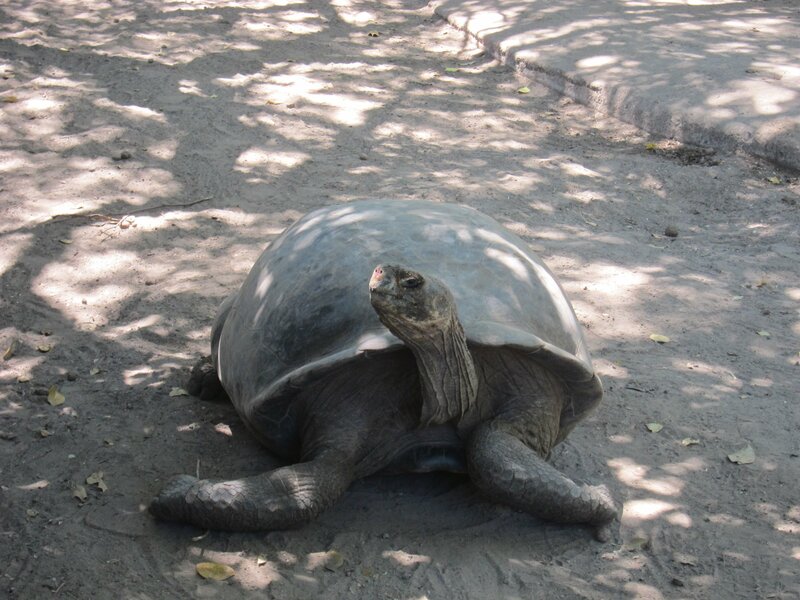 Walk up to the Charles Darwin centre to see more tortoises. 13. Scuba diving trip to North Seymour and Mosquera islands, this and Gordon rocks are the only places you can see hammerheads but for Gordon you have to be an experienced diver (use a reputable company, I felt really uncomfortable with the cheaper one we went with, gear was old). 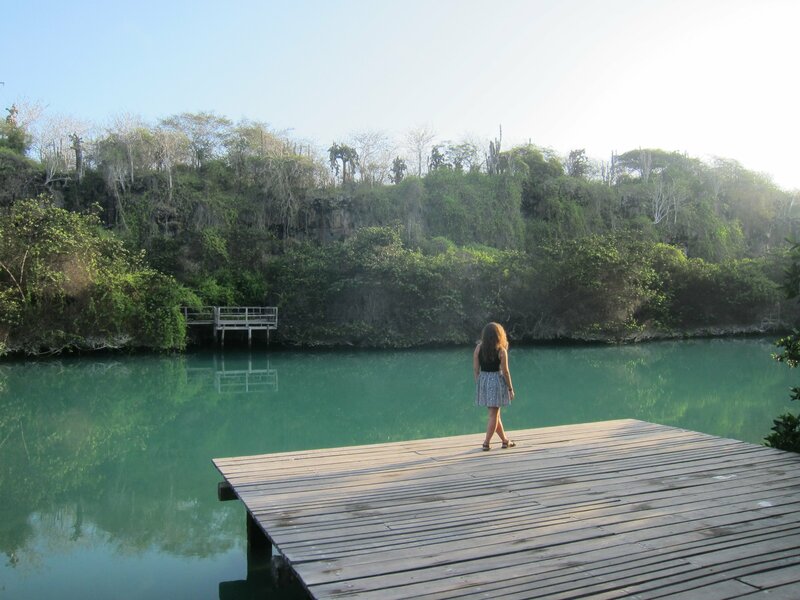 Lobos beach. 14. 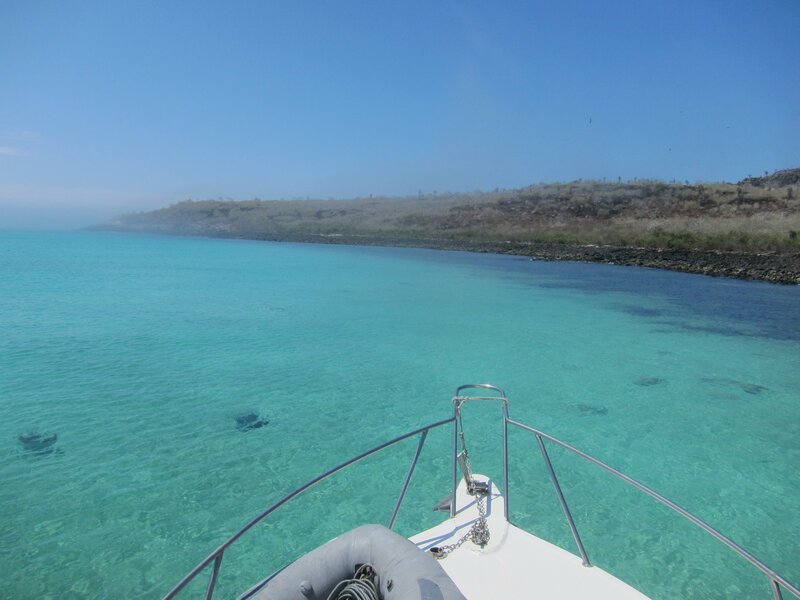 Day trip to Santa Fe island (snorkelling in various spots and fishing) we saw sharks, sea lions, turtles etc, this trip was really stunning the sea was crystal clear and you could spot sharks and turtles in the water from the boat, highly recommended. 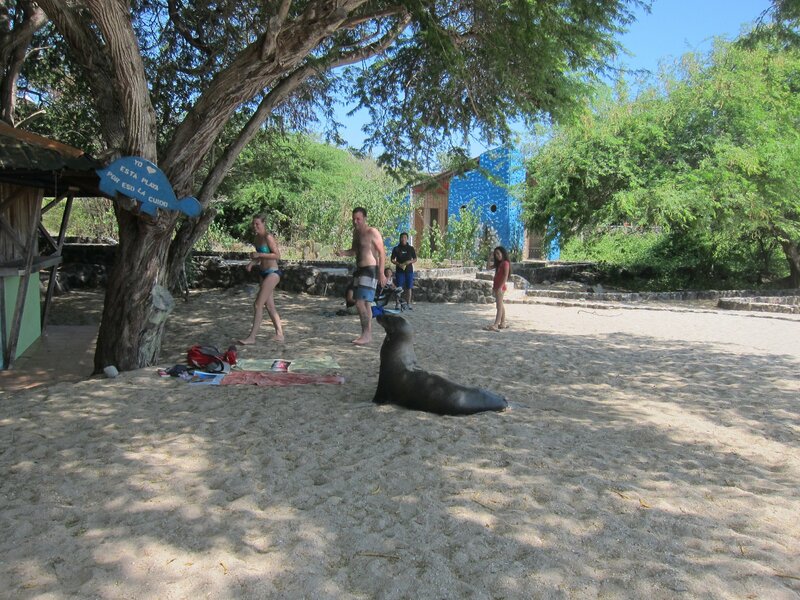 This itinerary gives a lot of variety of the Galapagos and you’ll see a lot of wildlife. We passed up the expensive Bartolome day trip as we heard it wasn’t really all that great. 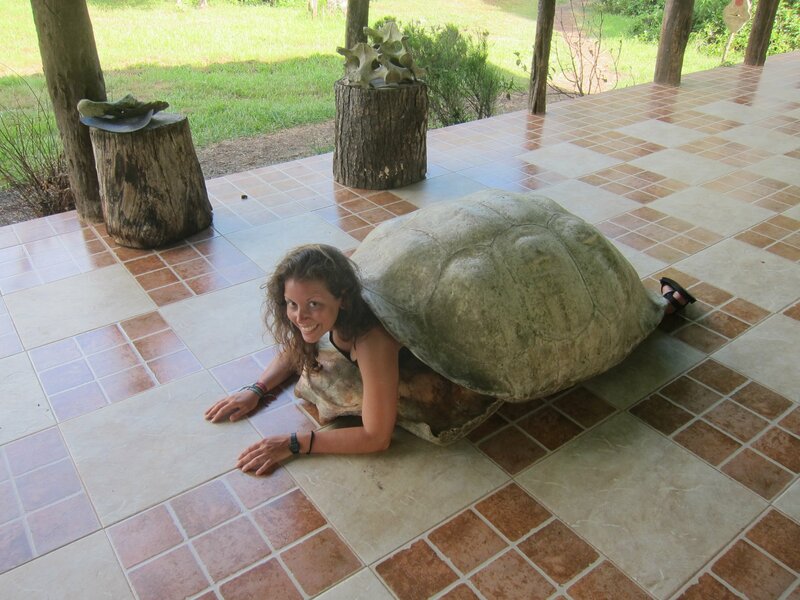 For any tips on travelling Galápagos get in touch.